These Madeleines are lemony, delicate and cakey. They are best enjoyed with a cup of coffee, tea and friends. Food is always better with friends. Enjoy! 1.Preheat oven to 350 degrees. Prepare two Madeleine pans by brushing them with softened butter. Set aside. 2. Sift flour, baking powder and salt into a bowl. Set aside. 3. Put eggs, egg yolks, granulated sugar, vanilla, milk, lemon zest and juice in the bowl of an electric mixer fitted with the paddle attachment. Mix on medium-high speed until pale and thickened, about 5 minutes. Add melted butter and mix until blended. 4. Gently fold the flour mixture into egg mixture. Don't over mix. 5. Spoon a rounded tablespoon of batter into each mold, filling it about two-thirds full. Bang the pans on the counter to remove bubbles. 6. Bake, switching position of pans halfway through baking and rotating 180 degrees, until the madeleines are golden around edges, 7-9 minutes. 7. Let cookies cool slightly in pans on wire racks. Invert, and unmold. Dust with confectioners' sugar. Cookies can be stored between layers of parchment in airtight containers at room temperature up to one day. So delicate and pretty - just want to reach through the screen and take a bite! 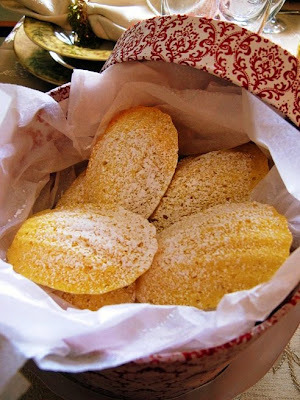 Having tasted these madeleines, I can assure you these are light, lemony and were perfect with my coffee. Mmmm. Lemon. One of nature's most perfect flavors. And these madeleines look just perfect. Hope you are well. Haven't stopped by in a long while. Food IS always better with friends, your lemon madeleines look divine! Merry Christmas!